Broner: I May Land One, That Motherf***er Pacquiao Will Sleep! Last week, Manny Pacquiao predicted a knockout victory in his upcoming fight with Adrien Broner. Pacquiao will defend his WBA “regular” welterweight title against Broner on January 19th at the MGM Grand in Las Vegas. Broner, a former four division world champion, is taking part in his first major pay-per-view headliner. Pacquiao has the clear advantage in speed, but Broner has been working on his timing with trainer Kevin Cunningham. 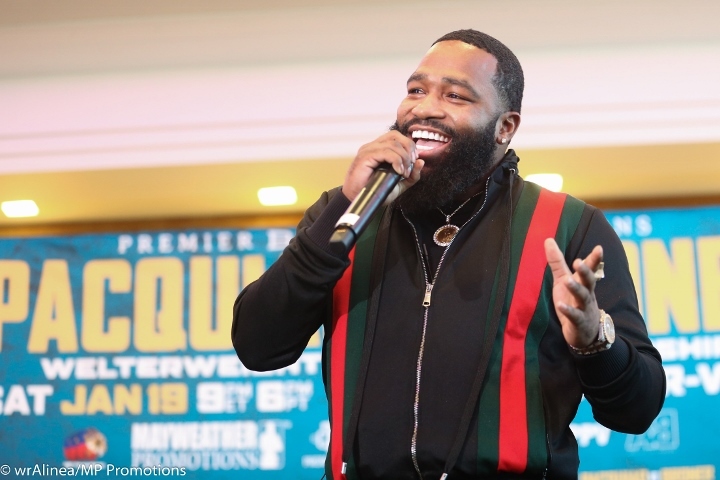 Broner is looking to get himself back in the elite mix, after fighting Jessie Vargas to a close points draw in early 2018. Pacquiao was in action back in July, when he demolished Lucas Matthysse to capture the WBA “regular” belt. He believes Pacquaio can be knocked out, as the Filipino boxer has been stopped in the past. He was sensationally knocked out with a single counter from Juan Manuel Marquez in their fourth bout in 2012. Broner has been down as a professional, but never stopped. “Timing beats everything, and this is just a good time for Adrien Broner and Pacquiao to fight. I’m ready physically, mentally and emotionally. I’m ready to go in there and let it all hang out. A few days ago, Pacquiao expressed his desire to knock Broner out. “I am not making a prediction (as usual), but my goal is to knock out Broner,” Pacquiao said.